This is a healthy version of the traditional calorie-rich North Indian staple. This recipe is rich in potassium, vitamin C, and zinc. It makes use of the fat from low-fat curd (for texture) and eliminates the use of oil/ghee completely. Garlic Cloves- 2 to 3 nos. • Grind ginger, garlic, and coriander in a mixer to make a paste. 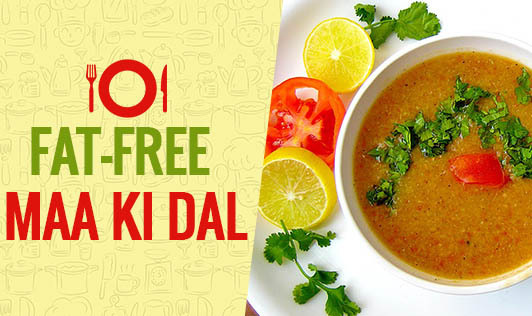 • Wash and soak the urad dal for 2 to 3 hours. • Drain the dal and keep aside. • Pressure cook, the urad dal along with onions and 1 ½ cups of water, until the dal turns soft. • Once the dal is cooked mash it slightly. • Now add the tomatoes, haldi, ground paste, chili powder, coriander powder and cumin powder and cook for 5 minutes until the dal thickens. • Add salt as per taste and stir well. • Finally add the curd and mix well.